Habit: Annual. Stem: erect, 1--6, +- glabrous. Leaf: basal and cauline; ligule 2--5 mm, membranous, rounded at tip; blade flat. Inflorescence: panicle-like, open. 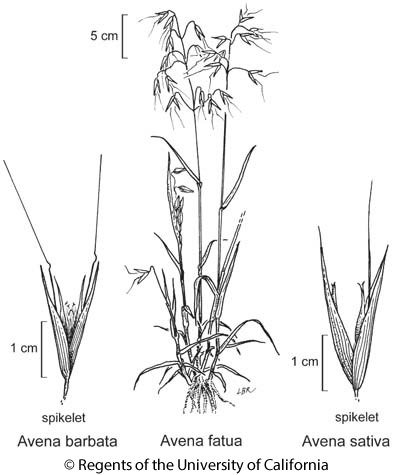 Spikelet: 15--50 mm, laterally compressed, generally stalked, +- pendent; glumes unequal or +- equal, generally > florets, membranous, 3--11-veined, generally glabrous; axis occasionally prolonged behind upper floret, vestigial floret at tip; florets (1)2--6(8), 2+ bisexual, reduced florets distal to proximal ones, breaking above glumes and between florets or not; lemma hard, glabrous to hairy below awn, awned at or slightly below middle, 5--9-veined, tip 2-forked, forks +- tooth-like, awn stiff, generally bent, slightly to often strongly coiled below bend; palea +- < lemma; anthers 3. Fruit: cylindric, longitudinally grooved, pubescent. Species In Genus: 29 species: temperate Europe, northern Africa, central Asia. Etymology: (Latin: oats) Note: Cult for grain, hay. California records of Avena strigosa Schreb. are based on misidentifications of Avena barbata. California records of Avena occidentalis Durieu, are based on a misidentification of Avena fatua. Stem: 3--16 dm, erect at maturity. Leaf: blade 10--45 cm, 4--15 mm wide, margins glabrous. Spikelet: 18--32 mm; breaking apart above glumes and between florets; glumes 18--32 mm, 9--11-veined; callus bearded; florets 2--3, lemma 14--20 mm, generally glabrous on back to soft-hairy in lower 1/3, tip 2-forked, forks < 1 mm, awn of lowest floret 25--40 mm, bent, twisted below bend. Chromosomes: 2n=42. Ecology: Disturbed sites; Elevation: < 2400 m. Bioregional Distribution: CA-FP, MP, DMoj; Distribution Outside California: to Alaska, eastern Canada, most of United States; native to Eurasia. Flowering Time: Apr--Jun Note: Hybridizes with Avena sativa. Citation for this treatment: Bernard R. Baum, James P. Smith, Jr. & Dieter H. Wilken 2012, Avena fatua, in Jepson Flora Project (eds.) Jepson eFlora, http://ucjeps.berkeley.edu/eflora/eflora_display.php?tid=15321, accessed on April 25, 2019. CA-FP, MP, DMoj; Markers link to CCH specimen records. Yellow markers indicate records that may provide evidence for eFlora range revision or may have georeferencing or identification issues. Purple markers indicate specimens collected from a garden, greenhouse, or other non-wild location.